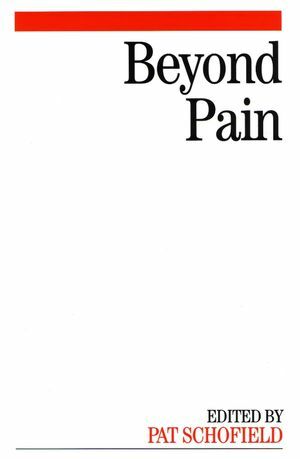 Chapter 1 The anatomy and Physiology of pain. (Rachel Drago). Chapter 3 The multi-disciplinary team. (Linzi Fletcher and Helen McDonald). Chapter 4 The assessment of pain. (Pat Schofield). Chapter 5 Massage. (Amanda Howarth). Chapter 6 Acupuncture in pain management. (Louise Robson and Joseph Robson). Chapter 7 Transcutaneous electrical nerve stimulation. (Debbie Poole). Chapter 8 The Sensory environment (Snoezelen). (Pat Schofield). Chapter 9 Food and Pain. (Sue Zmarzty). Chapter 10 Chronic pain pharmacology. (Margaret Dunham). Chapter 11 Alcoholism and addiction: The management of spiritual pain in the clinical environment. (Paul Bibby). Chapter 12 Pain in older people. (S.Jose Closs). Chapter 13 Future directions. (Pat Schofield and Margaret Dunham).